Many machines are completely reliant upon chains for their operation, so it makes sense to use the best chain possible and to get specialist advice when specifying a new or replacement chain. Derek Mack, UK Sales Director for Tsubaki, the world’s leading manufacturer of industrial drive chain, how a custom solution will often provide the best fit and deliver Total Cost of Ownership savings. As engineers we are hard wired to find the most efficient and practical solutions for any given problem. This often means that we buy and use standard parts when designing or upgrading a system as they tend to offer the best value at the point of contact. They are of a consistent and specified quality, and for the most part they meet our needs well. In fact, we are so used to going for the standard option that there can be a reluctance to consider custom solutions - but sometimes bespoke is better. Both conveyor and drive chains can be defined as ‘critical’ in applications where their failure would bring productivity to a halt. In such cases it is only sensible to specify a quality chain with long life expectancy with performance characteristics that are matched to the needs of the application. In many cases there is a surprising - and sometimes bewildering - choice of available chain technologies, and it’s advisable that specifiers talk to a chain supplier about the best choice for their application. Tsubaki engineers are constantly evolving the catalogue of standard chain solutions to keep up-to-date with the developments that are being made in manufacturing techniques across multiple industries. 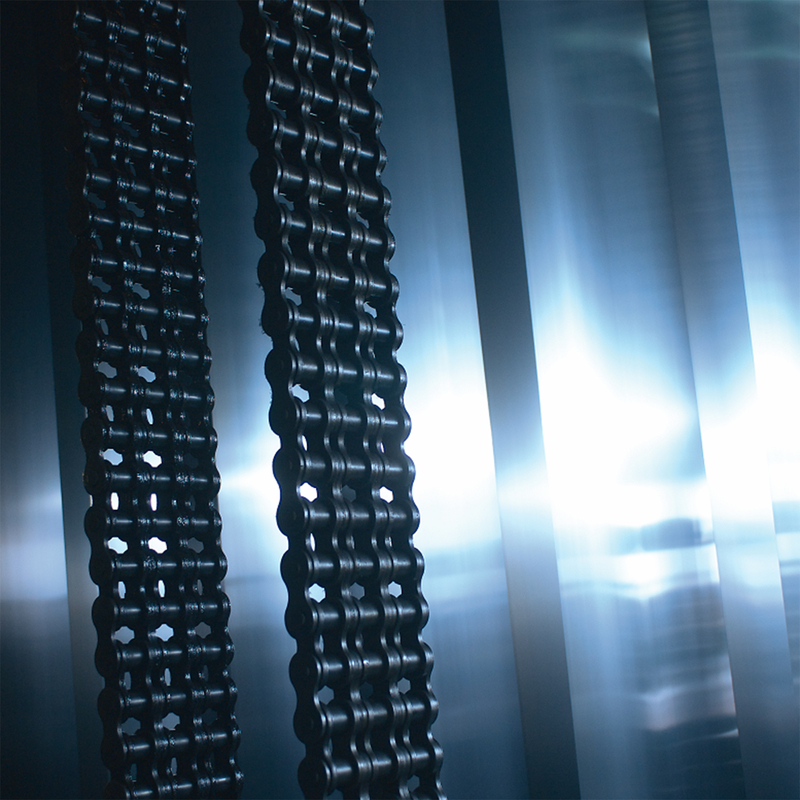 When a new manufacturing technique is developed that involves extreme temperature, contact with chemicals or exposure to extreme loads, we do our best to introduce a chain product that is fit for purpose. However, there are occasions when a process requires extreme performance capabilities or highly precise performance when custom chain might be warranted. In these cases Tsubaki is able to customise standard chain or engineer bespoke solutions. In fact Tsubaki maintains a technical department dedicated specifically to this activity. Its role is to help develop custom chain, unique attachments or unusual sizes to meet specific needs. Some of its output is not so different from standard chain and meets DIN/ISO standards; other projects require a completely bespoke solution and will probably far exceed the usual standards. In both cases we work very closely with engineers from the client company to fully assess the application requirements, consider different solutions and select the best one in partnership. We also remain in contact with the client after the sale to make sure our solution performs as expected and to offer further support if the application requirements change. 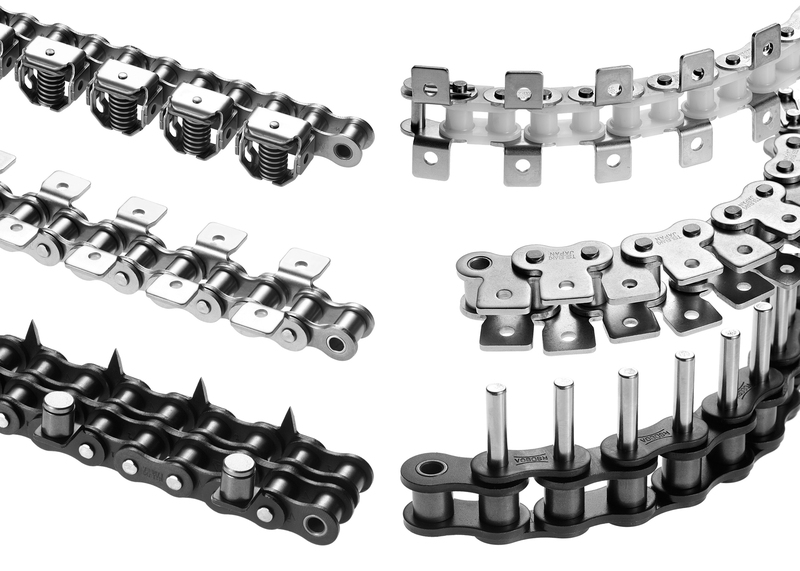 Custom chains are special chains that are designed for specific non-standard applications or extreme environmental conditions. Non-standard applications may relate to high speed, high loads, extreme shock loads, constant running, long periods of non-use, etc. Extreme environmental conditions could include the presence of fresh, brackish or salt water, steam or moisture; corrosive substances or atmospheres; extremes of temperature or temperature fluctuation; outdoor applications with extreme weather; or locations so remote that access is difficult. In truth the list of environmental considerations is practically never-ending as technologies progress. 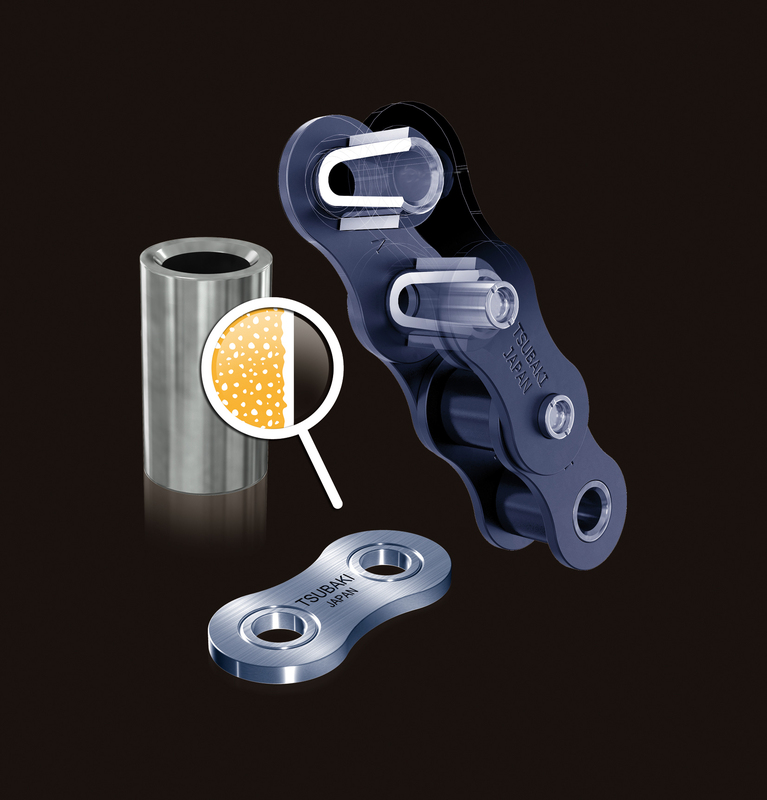 To meet all these needs Tsubaki has solutions based on lube-free chains, chains made from stainless steel and other high-performance materials, corrosion resistant chains, special coatings to inhibit corrosive attack by specific chemicals, non-standard chain geometry, special lubricants, heavy duty lubricants, etc. Tsubaki’s engineering team is on hand to match solutions to needs and thereby develop custom chains for particular applications. 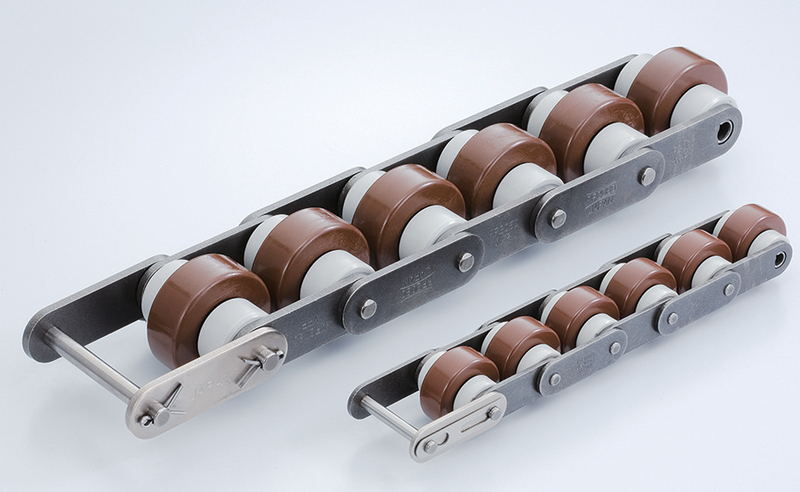 In conveyor chain applications, the attachments are as important as the chain itself. While Tsubaki has a wide range of standard attachments, it is also capable to design special solutions that meet particular needs. These could be based on pins, plates, special profiles, fittings etc. and could be made from a wide range of metals, engineering plastics, or other materials. One approach that Tsubaki often uses, particularly with conveyor chain, is to vary the pitch of the chain. Also, it is notable that there are DIN and ISO standards for conveyor chain, but these do not cover every eventuality. Therefore, we have also developed Tsubaki in-house standards in an effort to capitalise on the knowledge we acquire with each new custom project. Industrial chain is often considered a commodity product that serves as a means to an end. As engineers it’s logical to assume that a standard, cost-effective solutions should be specified while attention is paid to the more complex components that surround it. However, Tsubaki has shown time and again that correctly specified chain can improve service life many times. Speaking to a product expert and investigating the possibilities afforded by the latest chain technologies can eliminate unexpected stoppages, reduce maintenance costs and minimise downtime – which will greatly reduce the Total Cost of Ownership. Picture 1: Tsubaki has a wide range of standard attachments, it is also able to design special solutions that meet particular needs. Picture 2: Tsubaki has helped a steel mill in the Netherlands improve the long term operational productivity by retrofitting lifting chains with a working life of 10-15 years. Picture 3: A car manufacturing plant in France has almost completely eliminated the downtime caused by friction wear on conveyors thanks to the installation of Tsubaki Double Plus free flow chain. Picture 4: Designed with a special oil-impregnated bush, Tsubaki’s Lambda lulbe free chain benefits from an extremely long operating life without requiring messy external lubrication. Established in 1917, Tsubakimoto Chain Company is the world’s premier manufacturer of power transmission products with strong market positions in premium quality industrial drive & conveyor chains and associated power transmission components such as cam clutches, reducers & linear actuators. With a turnover exceeding $1,5 Billion US Dollars & 6,500 employees, the Tsubaki group includes 40 manufacturing locations and 75 group companies worldwide. Our production and sales networks are now more developed than ever. Tsubakimoto Europe B.V. serves Power Transmission customers in the Pan-European market, Africa and the Middle East from European headquarters located in Dordrecht, the Netherlands, along with a local subsidiary based in Nottingham, serving the UK market & Ireland and from the office in Unterföhring, Germany customers in Germany, Austria and Switzerland are served. Customers in Spain and Portugal are served by our office in Madrid, Spain.